Social enterprises from across the North West took part in a University of Ulster Knowledge Club workshop at Magee this week to learn how they can access up to £4,000 worth of business support through Invest Northern Ireland’s Innovation Voucher programme. Funded by InvestNI and Enterprise Ireland, the Innovation Voucher Programme offers small businesses support worth up to £4,000 (€5000 in the Republic of Ireland) to collaborate with universities and colleges to develop innovative business solutions Ulster is currently the lead provider of expertise under the Innovation Voucher Programme having supported over 150 small businesses throughout Ireland. 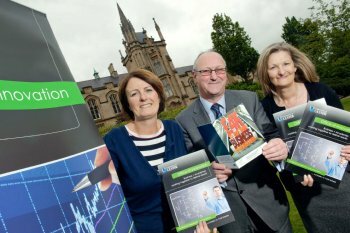 At the Magee workshop, which was led by the University’s Office of Innovation, participants heard about how the programme works and were given examples of how companies have successfully used Innovation Vouchers to gain a competitive edge. One social enterprise to have already benefitted from the University’s support is CÃºnamh ICT, a Derry based company that delivers both bespoke and off-the-shelf high quality database solutions to its customers, many of which are in the community and voluntary sector. Managing Director Peter MacCafferty said CÃºnamh ICT had really benefited from the Innovation Voucher programme by tapping into the expertise of academics at Ulster and as a result, they had been able to make significant improvements in terms of development times and deliverables. Kerry Patterson from the Office of Innovation said she was delighted with the response to the event. “Bringing the University’s expertise to social enterprises is a key priority for the Office of Innovation. We have already successfully worked with a number of social enterprises under the Voucher programme and they have reaped the benefits of Ulster’s expertise”.